After taking power in a blue wave, New Hampshire Democratic lawmakers are passing what amounts to be a green wave of legislation. It is also ambitious for New Hampshire, which has been less aggressive than its surrounding states’ environmental policy. “We need to catch up. 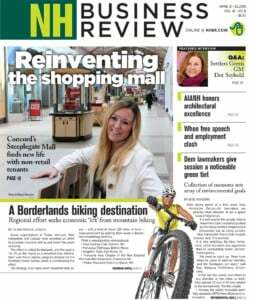 There have been six years of pent-up demand, and the floodgates are open,” said Rep. Rebecca McWilliams, D-Concord. • Increase the state’s renewable portfolio standards (RPS) from 25 percent renewable energy in 2025 to 60 percent by 2040. • Increase fivefold the size of projects eligible for net metering. • End the Regional Greenhouse Gas initiative (RGGI) rebate and use all proceeds for energy efficiency. • Allow the Public Utilities Commission to raise electrical rates to pay for storage projects and energy efficiency. The House also has voted to upgrade the state’s energy code, ban offshore oil drilling and call for offshore wind power. The bills don’t only relate to energy policy. In the House, bills have been approved to ban single-use plastic bags and plastic straws, double air pollution fines, cut the arsenic standard in half and expand wetlands regulation. Indeed, if you count another 11 bills re-referred or retained for next year — including a proposed carbon tax — you have an unusually high 90 percent survival rate. Still, we are only at the halfway point on April 11 — crossover day — when all bills passed by one chamber go to the other, and it is unclear whether the bills will survive, even though chambers are controlled by Democrats. Business organizations are lobbying hard against many of them. And it’s uncertain whether Gov. Chris Sununu will allow them to become law. Sununu, who has made his veto intentions clear on such issues as taxes, the death penalty and paid family leave, has largely been silent on environmental legislation. He has, as a former environmental engineer, touted his green credentials, so a blanket veto of all these bills might tarnish that image and hurt him in any upcoming election, whether it be to remain as governor or run for a U.S. Senate seat. The federal Green New Deal — most identified with U.S. Rep. Alexandria Ocasio-Cortez of New York and taken up by a number of Democratic presidential candidates — calls for 100 percent clean renewable energy by 2030. It also includes a massive public works program on the scale of the old New Deal during the Roosevelt administration. The deal would cost up to $1 trillion a year, partially paid for by a $60-per-ton carbon tax that will increase by $20 a year. It would also be financed by cuts in fossil fuel subsidies, expected avoided health costs from reducing pollution, and slashing the defense budget by $500 billion (on the premise that the nation would no longer need the military resources to defend foreign fuels). It also would help fossil fuel workers transition into the new economy as well as low- and moderate-income people bearing the brunt of the carbon tax and those living in areas affected by climate change. But the Green New Deal, at this point, is a resolution, not a comprehensive piece of legislation. New Hampshire lawmakers and environmental activist have developed their own energy blueprint, a white paper that echoes the Green New Deal’s goals of moving to 100 percent renewables (though by 2040) and joining efforts to create “a nationwide carbon pricing system.” But it was written in response to changes in the governor’s state energy plan, which favors lowering electricity costs over expanding renewable energy. In addition to a handful of Democratic representatives, white paper authors included Doug Bogen of the Seacoast Anti-Pollution League, Dan Weeks of ReVision Energy, Bob King of the Granite State Hydropower Association and Jasen Stock of the New Hampshire Timberland Owners Association. Not all environmental organizations signed on to the white paper. But for the most part, most of the bills have passed on party-line votes. The New Hampshire Senate passed bills upping the Granite State’s standards. Senate Bill 168 would increase the solar portion from .07 to 1.9 percent by next year and to 5.4 percent in 2025. SB 124 would increase the standards after 2025 on each renewable class, with the goal of reaching 60 percent by 2040. Bradley argued that since the law won’t take effect for another five years, it should be re-referred and studied. The House passed a bill that would set up a study committee to see what would be needed to move to 50 percent by 2040. One way to increase renewable energy is to raise the cap on projects eligible for a net metering, whereby the utility credits the customer for the amount of energy they generate. New Hampshire’s cap is currently 1 megawatt, lower than most caps around the country, including Massachusetts, which has a 2-megawatt cap on private projects and 10 megawatts for public projects. Peak demand has continued to go up in New Hampshire, where it has gone down in every other New England state. And that, said Mineau, means the state would pay a larger share into the grid, increasing transmission costs. The BIA has opposed increasing the net metering cap because of cost-shifting concerns, but individual businesses as well as municipalities are backing expansion as a way to cut electricity costs. It would enable Middleton Building Supply, for example, to build a solar facility to take care of all its electric needs, said Marcella Perry, the company’s chief financial officer. She added the company could build separate smaller facilities to increase generation, but then it would have to multiply startup and overhead costs, making it less economically feasible. “Give us an opportunity as a business to make our own business decisions,” she said. The House also has passed House Bill 466, which would increase the upper limit on a small generator from 100 to 500 kilowatts, allowing more small businesses to get a better reimbursement rate than originally set for rooftop solar. “They keep talking about ratepayers. Nobody pays rates, they pay bills,” replied Backus, sponsor of the bill, arguing that the legislation would help not only those that participate in the program to cut the amount they are paying but by lowering peak demand, cut transmission and distribution costs, which would save money for everyone else. Many of these same arguments about energy efficiency are similar to the debate over what to do with the proceeds from RGGI, the nine-state program that requires power plants to purchase the right to emit carbon into the air. Since 2012, New Hampshire has rebated about three-quarters of the RGGI proceeds back to the ratepayers, far more than any other RGGI state. 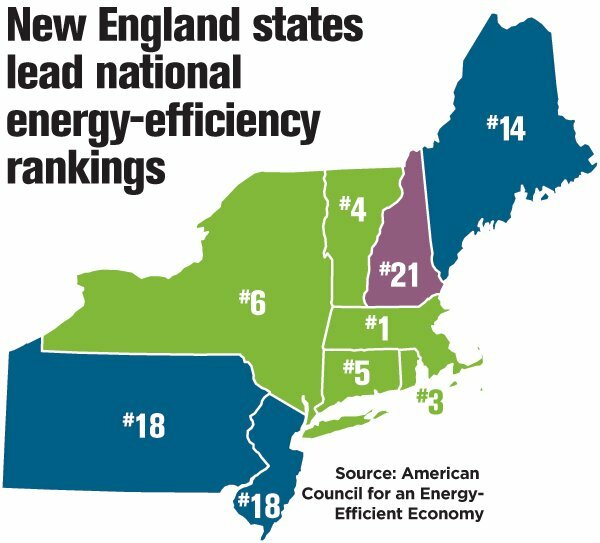 All of New Hampshire’s neighboring states, for instance, spend all RGGI proceeds on energy efficiency or renewable programs. Under SB 122, New Hampshire would join them. It would end the rebates and direct all RGGI proceeds to be spent on energy efficiency, increasing the amount going to low-income residents, school districts and local governments. The House version — HB 582 — would do the same for residential rates, though it would rebate the total amount to businesses and institutions. Lawmakers would also allow the PUC to increase the system benefits charge, which supports energy-efficiency projects, as long as a reduction in peak demand ends up saving ratepayers more than it actually costs. Lawmakers passed a bill last session that would require that the Joint Legislative fiscal Committee approve such adjustments, but SB 205 would take them out of the loop until at least 2026 and HB 166 removes legislative oversight altogether. Similar bills, would allow ratepayers to foot the bill for storage investments. SB 204 would allow utilities to pass along storage costs to customers if they increase reliability and efficiency. (It also would allow municipalities to exempt energy storage systems from property taxes.) HB 715 would allow the PUC to impose a tariff to reach a 2 percent storage reduction goal in peak demand, allowing it to up that goal to 15 percent if it is deemed to be in the best interest of the ratepayers. Ends RGGI rebate for residential customers and gives all proceeds to residential and municipal projects. Rebates all commercial proceeds to businesses, with none going to commercial energy efficiency. It also would make RGGI a permanent, non-lapsing program. Updates RGGI so it conforms to the increased goals of the regional programs to reduce emissions. Removes the requirement that the Legislature approve increases to the system benefits charge on utility bills used for energy-efficiency. Remove the requirement for legislative approval of system benefits charge changes to increase energy efficiency for the next six years, but a fifth has to be spent on projects benefiting low-income residents. Increases net metering limit from 1 to 5 megawatts for renewable generation and storage. Also would account for it as load reduction, enabling the state to reduce peak load. Increases the apportionment for net energy metering provisions from electrical facilities with total generating capacity of 100 kilowatts to 500 kilowatts. This allows more small to mid-sized businesses to take advantage of the law. Requires competitive electricity suppliers to purchase electricity generation from net energy metering just like regulated electric utilities do. Known as the “Low-Income Community Solar Act of 2019,” it requires two low-income net metering solar projects in each utility service area, with more favorable metering terms. Repeals the requirement that NH Public Utilities Commission estimate and give credit for the total yearly production for customer-sited sources that are net metered. Increases the renewable portfolio standards by a certain percentage each year after 2025, currently at 25.2 percent. Increases the solar renewable portfolio standard from .07 to 1.9 percent in 2020 to 5.4 percent in 2025. Initially sets a goal to reduce peak demand via energy storage by 2 percent, charges the NH Public Utilities Commission to cut it as much as 15 percent, allowing the PUC to increase rates, as long as it results in a net benefit to ratepayers. Includes energy storage among the distribution costs ratepayers pay on their electric bill. Defines solar energy systems and wind-powered energy systems so it can be exempted from real estate assessments of value. Permits municipalities and counties to develop plans for electric aggregation programs. Requires the energy strategy of the state to include consideration of the effects of climate change. Prohibits offshore oil and natural gas exploration off the shores of New Hampshire. Updates all building codes from 2009 to 2015, including the energy code. Prohibits electric distribution companies from acquiring natural gas capacity or supply or interests in natural gas infrastructure at ratepayers’ expense. Excludes the cost of lobbying and political activity from the rates of public utilities. Creates a clean energy resource procurement commission. Enables a payment in lieu of taxes for a combined heat and power agricultural facility. Creates a statewide online energy data platform regulated by the NH Public Utilities Commission and operated by the state’s electric and natural gas utilities. Prohibits food service businesses from providing a single-use plastic straw to a customer unless specifically asks for one. Prohibit stores of more than 1000 square feet from giving out single-use plastic bags after using up inventory, and requires stores charge a least a dime for reusable bags. Declares Coakley Landfill as an imminent hazard and directs state Department of Environmental Services to contain it or clean it up. Cuts arsenic limits in drinking water in half. Brings back the complete ban on burning C&D waste. Doubles most air pollution control penalties. It also adds a clause that would count each violation as a separate offense, greatly enhancing penalties. Requires that all of the state’s motor vehicles will be zero emissions vehicles by the year 2039. Funds for the project development phase of the capitol corridor rail project. Imposes a tax every ton of carbon equivalent fuel sold, used or entered. Starts at $20 a ton, ends up $120 by 2030. Would require the NH Department of Environmental Services revise rules relative to perfluorinated chemical contamination in drinking water. The committee recommended the bill go back to committee. Increases the cap net energy metering limits for customer generators from 1 to 5 megawatts. Would prohibit the transportation, storage and disposal of nuclear waste. Allows towns to regulate the distribution of single-use plastics. Enables municipalities to prohibit the distribution, sale, and purchase of products that contribute to plastic pollution. Would give a private right of action for toxic exposure. Would require companies that release toxic substances pay to medically monitor those who might have been exposed to them. Would establish a grant program to support municipalities in updating their wetlands regulations. Creates a buffer area around wetlands. Supports efforts to develop wind power off the New Hampshire coast. Relative to labeling, signage and restrictions on the sales and use of bee-toxic pesticides.